Icelandic actor, Hafthor Julius Bjornsson, who stands at 6 feet 9 inches tall, towers over his 5 foot 2-inch wife Kelsey Henson as they posed at the Game of Thrones Season 8 premiere on Wednesday night. For the event, the 2018 World's Strongest Man sported a blue-green tuxedo with a white shirt, bowtie, black pants, and black shoes while his Canadian waitress-wife wore an elegant black dress with a slit up the leg. 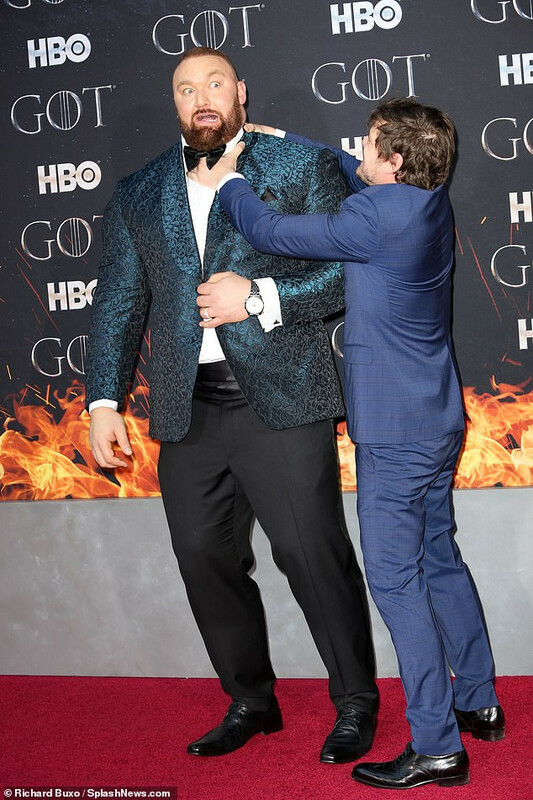 At one point, Bjornsson, who plays Gregor 'The Mountain' Clegane on Game of Thrones got playful with former Game of Thrones star Pedro Pascal, who pretended to 'choke' him on the red carpet.